I created this blog to serve as a knitting journal for myself and also to show friends and family my creations as I am pursuing my BFA in Dance at college. This past Thanksgiving break I experimented with felting for the first time and was very pleased with the results! I used Universal Yarn inc. Deluxe Worsted LP 100% wool. This is a larger felted bowl in another color using only one strand. I made this hat a couple months ago using the "Fake Isle" pattern from magknits.com I used Noro Kureyon and black Lamb's Pride worsted wool. The self-striping Noro makes the pattern look a little more complicated than it really was. 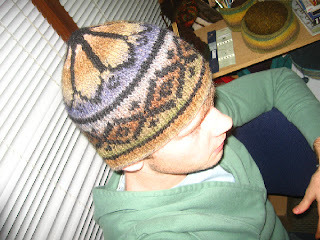 Here is another hat using the hat pattern from Rowan Magazine #40. 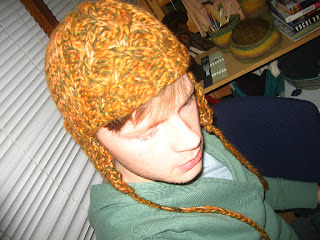 I used two worsted weight yarns stranded together (a kettle-dyed orange wool and Classic Elite Skye Tweed in green) The pattern has a nice cable design at the front and earflaps that are attached after the construction of the hat. WIth my long break last week I was able to knit up a scarf in addition to my felted bowls. I used an old pattern written in German. Fortunately, I was able to read the diagram indicating the knit and purl stitches. The pattern consisted of garter stitch, seed stitch, basket stitch, a diagonal sequence, a checked ribbing, and horizontal ribbing. 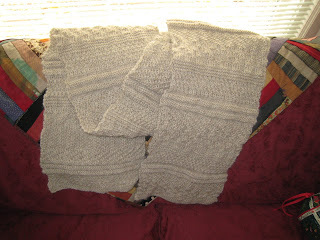 I knit it up using Nashua Creative Focus Worsted 75% wool 25% Alpaca (one of my favorite yarns among several others) I had a tough time deciding between colors, but ended up selecting Taupe Heather for this winter scarf. a fair isle hat using another one of my favorites, Tahki Donegal Tweed Homespun wool paired with Lamb's Pride wool and a few rows of Nashua Creative Focus. I am also in the process of making a sweater using the "Noah" pattern from last spring's Rowan magazine. 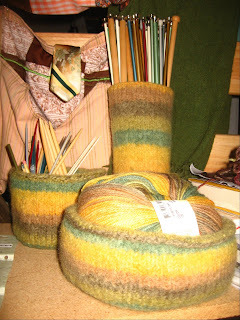 A wool afhan, felted basket, and a few other accessories for gifts are also in the works currently. I like all multiple things you knit in those beautiful colors.